One good thing about the MHS Band being split this year into the Wind Ensemble and Concert Band is that it makes for longer concerts. 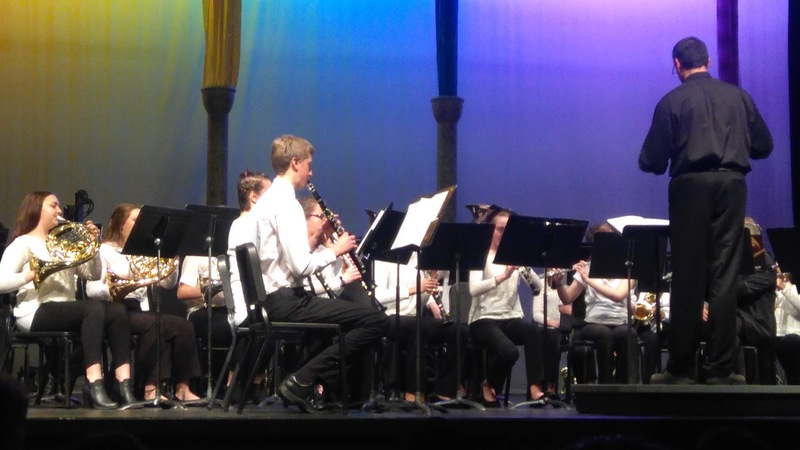 The bands and percussion class presented a very enjoyable show last Wednesday and I think the audience would agree that they could have played twice as long, especially the percussion class. And wasn’t it nice of the drama department to do the beautiful stage setting! Our next Band Parent Meeting has been rescheduled from February 12th to February 19th. Same place (Freshman Den) and same time (7:00 p.m.) I just found out that there will be a special concert happening at what was our originally scheduled time. What I know so far is that all the groups that Dana Libonati is involved with (Twilighters, Vintage Voices, the Jazz Band, and others) will be performing a concert of Dana Libonati music. Should be fun. If I hear more, I’ll let you know. The props for the Winter Guard show have been designed, mostly constructed, and are heading over for test runs really soon. Modifications will be made if needed and then it’s painting time. I have an idea for a place to paint them (not yet confirmed), but with the Guard Premier event just 2 weeks away and a lot of surface area to cover, we will be needing many hands to get everything done on time. If you would like to join in this props painting party, please respond to this email or send me a text at 971-901-6477 and I’ll get you more details. THANKS! We’ll be starting the set up this Friday afternoon and finishing the clean up Saturday night. If you can lend a hand – even for just an hour or two – please do. You can email Kami at kamantha_7@hotmail.com to let her know when and where you’d like to help. If you don’t know the when and where, I’m sure she can find something for you. Us Music Boosters sooo appreciate any help we can get at this crazy busy, but absolutely fun event that supports our music education! Winter Percussion and Winter Guard Rehearsals – Tuesday, Thursday, and Saturday as usual.